The principle of gender equality is one that has taken root in many nations around the world. In a 2015 survey of 38 nations, majorities in all but one country (Burkina Faso) said it is somewhat or very important that women have the same rights as men in their society. 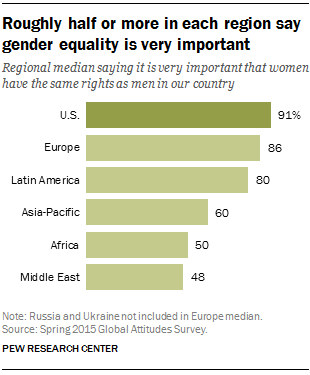 And a median of 65% worldwide said these equal rights are very important. This sentiment was strongest in North America, Europe and Latin America. In 2015, roughly nine-in-ten or more in the U.S. (91%) and Canada (94%) said gender equality was very important. A median of 86% in Europe and 80% in Latin America held the same view. Within the Asia-Pacific region, Australia stood out in the survey, with roughly nine-in-ten saying women’s rights are very important. The next highest percentage in the region was in India, where 71% agreed. Only about half of those in Africa (a median of 50%) and the Middle East (a median of 48%) said equal rights for women are particularly important. People in Burkina Faso (31%) and Senegal (39%) placed the least importance on gender equality. In fact, roughly a quarter in each country said it is not important at all that women have the same rights as men. Overall, support for gender equality was higher among women, those with more education (at least a secondary education in emerging and developing nations and at least a postsecondary education in advanced nations) and, in Europe and the U.S., those on the left of the ideological spectrum. In 24 of the 38 countries surveyed in 2015, women were more likely than men to say that gender equality is highly important. In many cases, the gender gap was substantial. For example, there was a 25-percentage-point gap in Tanzania, where 73% of women placed a strong importance on gender equality, compared with 48% of men. Pakistan, Uganda and Senegal also had gender gaps of more than 20 points on this issue. But in many of the countries where support for women’s rights was highest, there was no significant difference in the views of men and women. For example, 93% of women and 90% of men in the U.S. and Australia said it is very important that women have the same rights as men. And 94% of men and women in Canada held this view. People with higher levels of education reported stronger support for women’s rights in 19 of the 38 nations surveyed. For instance, just under half of those with more education in Burkina Faso (46%) said gender equality is very important, compared with 29% of those with less education, a 17-percentage-point difference. Similarly large differences by education level were also found in Senegal and Ukraine, where those with more education were respectively 16 and 14 points more likely than those with less education to say gender equality is very important. In the U.S. and Europe, those on the political left were significantly more likely than those on the right to say equal rights are very important. This ideological divide was largest in France: 91% of those on the left said gender equality is highly important, versus 76% of those on the right. Ideological differences were also notable in Poland (74% vs. 62%), Italy (87% vs. 77%) and the UK (95% vs. 89%). Similarly, in the U.S., liberals were more likely than conservatives to prioritize women’s rights (95% vs. 89%) despite the high level of public support overall.